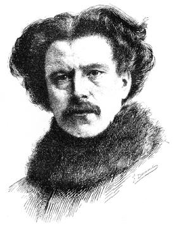 Maurice Rollinat was a French poet whose life spanned the second half of the 19th century. He was born on the 29th December 1846 in the town of Châteauroux which is the capital of the department of Indre, located in central France. When the boy was two years old his father was the local representative on the National Assembly. One of his father’s close friends was the female novelist George Sand and it is widely believed that she inspired Rollinat when he produced his first collection of poetry in 1877, this being titled Dans les brandes. In stark contrast to this work he also wrote a book of verses for children in 1893 called Le Livre de la Nature. Many of his poems were adapted as songs and Rollinat himself often performed them, accompanied by a pianist, at the Paris cabaret venue called Le Chat Noir. He was a pale, gaunt man whose often electrifying performances were inspired by the many well-known faces seen at the cabaret including the likes of Sarah Bernhardt, Oscar Wilde and Leconte de Lisle. Artists seemed to find his face interesting as a number of portraits of him were painted. This was one of Rollinat’s poems that was much admired by Oscar Wilde and many others, establishing his name amongst the great French poets. He married an actress named Cécile Pouettre who died, tragically when she contracted rabies and Rollinat was so distressed by this event that he became deeply depressed and attempted suicide on a number of occasions. Eventually his mind was so disturbed that he was admitted to an institution for the insane at Ivry-sur-Seine and it was here that he died. Maurice Rollinat died on the 26th October 1903 at the age of 56 and he was buried in the Saint-Denis cemetery in Châteauroux. In the poet’s honour a sculpture was produced by Rodin called “Poet and the Muse” and this can still be found on the wall of a village church in Crozant.